Let's start with a disclaimer, shall we? I by no means consider myself an expert on much of anything. I'm the kind of gal who is a jack of all trades but master of none (see: how I am not using my masters degree). Thus, I would never call myself a pro when it comes to all things Etsy - I am still learning and am proud of it! Therefore, this post is not about how you SHOULD package and send your Etsy products. Rather, it's my way of sharing what's worked for me. That said, one of my favorite parts of this Etsy gig is how I feel it bring joy to others. I was actually laying in bed last night wondering what it is that drives me to continue spending my nights making jewelry on the card table in the corner of my living room. I LOVE hearing back from my customers, meeting new people along the way, and networking with other artists. And as opposed to my love for scrapbooking, which is an often isolated, self-indulgent craft, I love how I get to give my creations away to people who actually appreciate them (let's just say the homemade photo calendar I made for my husband now hangs in my office!). My love language is gift giving, so naturally the whole making-jewelry-for-others thing just thrills me. But the giving doesn't just stop at the jewelry - it continues through to the wrapping and packaging process (bet you can imagine what I spend most of my time doing around Christmas!). I therefore see it as important to take the time to thoughtfully and intentionally package my products. I LOVE getting things in the mail (minus the bills), even if I bought it for myself - there is something so timelessly joyful about finding a little package with your name on it on your front door step. Whenever I order things from other sellers on Etsy, I wait until I see their packaging before I leave them feedback, because some (nameless) people really just throw their items in a box and stick it in the mail (last night I got a package of supplies I ordered in a box my husband called "a hot mess." I was surprised the contents were still in tact as it didn't really resemble a box at all... more like a dog chew toy). Above: gift I wrapped for Christmas in my favorite color scheme and pattern :) I thus put a good amount of time into my packaging, and for several reasons: 1.) I take pride in my work and want to make sure it looks professional. 2.) The customer paid for the shipping - I thus see it as my job to make sure the product gets to the customer in perfect shape. 3.) Buying jewelry for yourself or as a gift is an experience, which should include the thrill of opening up a package specifically designed just for you! 4.) Packaging is the last the customer might see of you - I thus strive to leave a lasting impression and make sure the customer knows I value their business. 5.) I see the chance to make what I love and share it as a gift. Each purchase on my site helps me keep doing what I love. I can only give a gift back in return, then! And, hello!? Who doesn't love opening up gifts?! After I get notice after an order is placed on Etsy, I print out a receipt so I can physically keep track of who gets what. I also e-mail the customer telling them that I am grateful for their business and giving them an estimated time of arrival of their product. This is a handy way of opening the lines of communication and reminding them a person, not a machine or factory, stands behind my shop (I have made some great, great friends this way)! I then get out my trusty box-o-supplies. When I started doing this Etsy thing seriously I invested some time (and not-so-serious pennies) into getting some return address labels, stationary, and business cards made, thanks to super-fabulous site VistaPrint. I saw it as important to create a cohesive "brand" in anything bearing the Bead Up name, thus sticking with the brown and lime green color scheme and, on the paper products, this neat-o swirly design. Here are my staples: return address labels, business cards (which have a duel purpose), stationary, brown and green markers, green curl ribbon, and of course, bubble envelopes. The majority of items I sell are dainty necklaces. Rather than investing in some ugly, white plastic jewelry display holders, I figured the business cards were a better use of supplies! I start by punching two holes about a centimeter from the edge of the card, about 1/2" apart. I then cut two little slits from the top to the holes to make them accessible from the top. Then I put about 2/3 of the necklace in a little plastic bag, leaving the face of it hanging out. I also loop some tape on the bottom of the backside of the card. Next I adhere the bag onto the tape and pull the two chain strands that are exposed through the slits and into the holes, like so. I then turn the card over and gently place the necklace on the facade of the card. Viola! I have me a neat-o and super inexpensive way of displaying each piece! And even though I use bubble lined envelopes, you can never be too careful. So I double, and some times triple, wrap the item in bubble wrap, or any other kind of lining. This particular set of bubble wrap is left over from when I moved. I also re-use the puffy plastic lining from the supplies I get from Artbeads - keepin' it green! Add some inexpensive green curl ribbon (thank you, Target!) and suddenly you have a both safe and cute looking little package! And no package is complete without a little note, right? I make a point to write a little note on my stationary to every buyer. This simple act has prompted the most response when I hear back from buyers - it's a personal touch that is not common with internet buying! I then use matching stationary and a return address label for the front, and just use packaging tape to adhere the piece of paper and the sides. I find it important to include my website name on everything so that it's nearly impossible for a buyer to lose the address. No one will wonder who sent this package, eh? Not everything I sell fits in these envelopes, or sometimes they are so small they don't need a whole envelope. As both a way to reduce waste in the environment and as a way for me to reduce extra costs, I make a point to re-use mailing envelopes and boxes whenever possible. I've been known to use old shoe boxes, old watch cases, old mailing bubbly envelopes, and even old ring boxes! Though some of these re-used items means often make the final packaging product look a little gnarly, I have yet to receive a complaint from a customer - and instead make a point to thank them for allowing me to re-use materials! I also custom package items if I know they are for a special occasion. Here's a picture of the packaging I did for a bride who bought these starfish necklaces for her bridesmaids - her wedding colors happened to be lime green and white! "I really loved all of your effort in packaging my items. It was like a lime green birthday party! 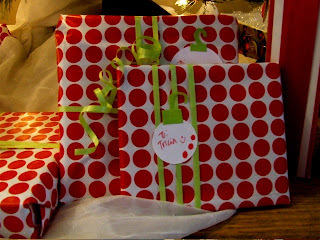 I loved see all the ribbon tied on my special packages and your hand written note is a wonderful, personal addition. Its always nice to see such care taken and I just wanted you to know that it is appreciated!!" So, there you have it, boys and girls. Why packaging is more important than you may think, why it is fun, and why it may be important to cultivating returning customers and, if not, at least happy ones! Now, get yourself over to Vistaprint, get yourself some business cards, and get the scissors and tape out! I definitely noticed and loved the packaging you did on the items I ordered a few months back! I love giving nicely packaged gifts but often wonder if people really notice. Glad to hear you are getting great feedback! Oh, and I love Vistaprint! I really enjoyed reading this post, your packaging is beautiful! I agree that it's worth it to put extra effort into your packaging...I know I try to! Great packaging tips. I love the necklace ideas. any tips on how to package my shirts? This is definitely helpful - thank you!